You probably think that with m7, m6 and mMaj7 you have all your minor sounds covered, but there is probably one type of minor that you don’t use! That’s what I am going to talk about in this video. Roughly speaking we tend to split our minor chords in two different sounds, the ones coming out of the major scale and the ones from the melodic minor scale. In both cases the m7 chord is used as part of a cadence and is used to suspend the chord that follows it. Another possibility is that the minor chord is a tonic in the song. In our case that would be a song in A minor. It is also used as a IVm chord in a major key, so in the 2nd half of example 2, you see a IV IVm I in E major. In the examples above we could easily substitute the AmMaj as well as an Am6. So in the examples above we have a m7, and the m6 and mMaj7 chords that are the basic chord categories. Both can of course have extensions added to them depending on the context where you use them. One more type of chord that i inbetween the two is the m13 chord, since this chord has a b7 and the 13 (enharmonic to the major 6th). This chord is associated with the Dorian sound, and is indeed only possible on the 2nd degree of the major scale. You could also look at it as being the major scale stacked in 3rd from the 2nd note in the scale. We tend to see minor chords as either II or III chords or tonic minor chords, they either imply some parent major scale or melodic minor. When you have a m13 chord it is more difficult to use as a II chord because it contains the 3rd of the dominant chord. On tonic minor chords we already have the melodic minor scale which in itself is an interesting sound, and which is also from a tonal perspective much more stable. There are songs that make use of the m13 sound. Most of them are from the period where it was introduced in jazz and later. But it is also occasionally found in standards like Invitation. Some famous songs would be Recorda Me or Time Remembered. Mostly it is used as a tonic sounding chords, but it was also often used in other contexts when interpreting standards from the mid 60’s and on. If we are going to use the chord we need a few voicings to be able to put it to use in some of the contexts discussed above. 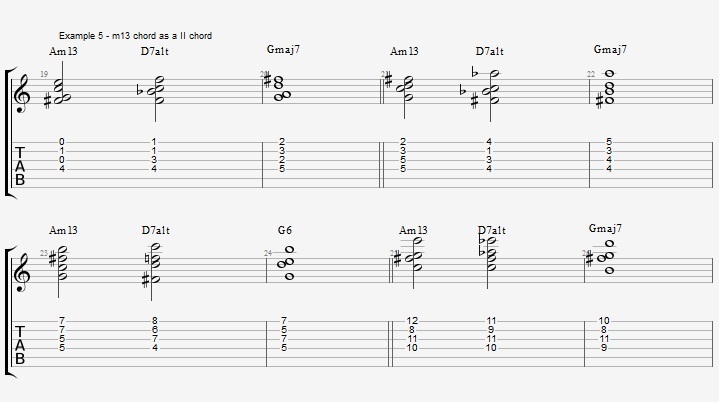 In example 4 I have written out a few good Am13 voicings that you can check out. If you want to hear a m13 chord being used as II chord then check out some of the 60’s Herbie Hancock with Miles Davis when they play standards. The idea is that we are not so much focused on the harmonic movement. Instead each chord is considered an island of sound and we can color it how we choose. You could call this a modalization of the standards. Since the m13 takes away the suspension of the dominant effect we use altered dominants to make the difference bigger. The easiest way to use it as a tonic minor chord is to just throw it in at the end of a cadence. That is basically what I have done in example 6. You should watch out a bit with the voice leading here and there though. That were some examples of how I use m13 chords in cadences and as tonic minor chords. I like the modern sound that these progressions have. It is a nice surprising sound that you can pull out when there is room for it. This means that you probably don’t want to use it when there are a lot of chords. It will fit more in places where there is more room to enjoy the richness of it. This is of course also how you will see it used most in the songs and examples I mentioned in this lesson. You probably want to start by substituting a m13 chords into a song in the songs that have a long stretch of a minor chord. A medium Blue Bossa or I’ll remember April could be good standards to experiment with. In a cadence you could also try adding the m13 to a ballad like I fall in love to easily. 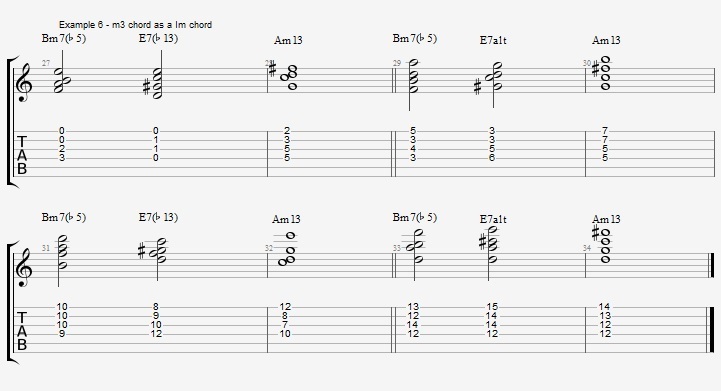 This entry was posted in Blog, Lesson and tagged chord voicings, chords, Dorian, m13, minor13 on December 29, 2016 by jens.